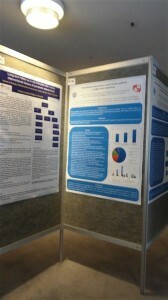 A poster pin board is an easy way to gain space for attaching e.g. posters. 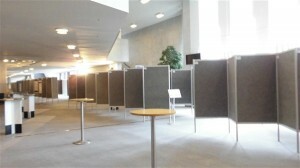 We have almost 300 boards, so even very large poster exhibitions are possible. 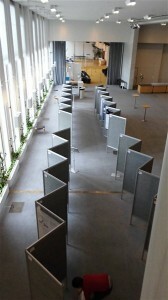 The board is double-sided and can be used as a standalone option supported by feet. 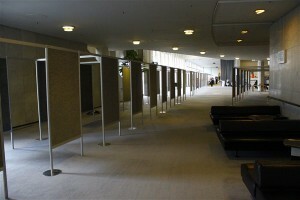 Boards can also be chained together, either in a straight line or in a zig-zag arrangement. Other structural solutions are also possible, as the vertical profile allows for expansion in eight different directionsat 45 degree intervals. 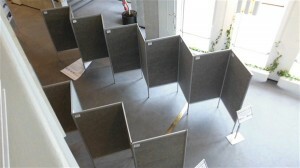 The area of the poster pin board on which you can affix posters is 95×160cm and the material is grey felt. 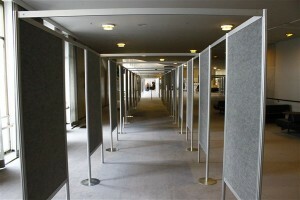 Affixing posters is easy using pins, while boards can be hung from the upper edge of the screen using hooks. A light can be attached to the upper edge of the screen if necessary. 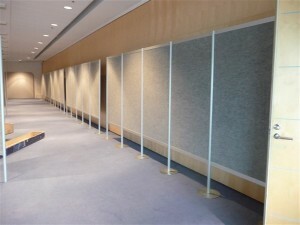 The rental price of the poster pin board depends on the quantity ordered. The price always includes the assembly and disassembly of the screens. In addition to the rental price, we also charge transportation fees which vary according to delivery distance and time. Read our poster board brochure or call us to find out more about our services.